Gabrielle Fawkes is a detective with the Las Vegas police department and she is trying to survive and get the revenge she deserves by arresting the drug lord that brutally killed her husband. After getting shot while trying to catch the drug lord, she meets Luca Rizzoli in the same hospital room. Both are recovering from gunshot wounds. He is very handsome and she is finding herself attracted to him, especially when he speaks to her in Italian. He owns an Italian restaurant, so she will have to check it out one evening soon and maybe see him again. Luca Rizzoli is part of the Vegas mafia, after his father's betrayal, Luca is trying to bring honor back to his family's name. When he meets Gabrielle, he is drawn to her, and for a man that is only out for one-night stands, he wants more from her. What happens when Luca finds out what Gabrielle does for a living and she finds out who he really is? Will they work together to bring down the drug lord that killed her husband? Will the Don of the mafia family let Luca and Gabrielle continue a relationship? I am loving this series, who wouldn't love the bad boy mafia man and the take-care-of-herself detective that also needs protection at times. And the suspense of who done it is great too. I can't wait for book three, it will be Rocco's story. Though this can be read as a standalone, I highly recommend reading Nico first as this story feeds off it and it’ll make it that much more awesome! This is an excellent “mobster” book – I enjoyed every page! Luca is one of the head Dons and he’s worked very hard for his spot as his father once betrayed the family. Luca has earned respect, but there are a few in the mafia who still don’t believe in his honesty – especially when he winds up falling for a cop. Gabrielle’s husband was murdered years prior and she’s spent every moment since attempting to track down his killer. When she’s pulled off the case at work, she struggles with not being able to land her husband’s killer but at the same time, she’s also a lot freer. Then when she meets Luca, she thinks she’s found a distraction but quickly discovers that Luca isn’t exactly as “clean” as she’d like to think. I think my absolute favorite part of this book is Gabrielle and her absolute fierceness. Even with Luca being a total alpha male, Gabrielle never just bows to him and I love that. I absolutely love Luca and Gabrielle together, they’re perfect for one another and the perfect balance of soft and hard. This story has a fast pace, great characters, and an intriguing storyline. I really enjoyed it! For reviews & more info, check out our Nico post. 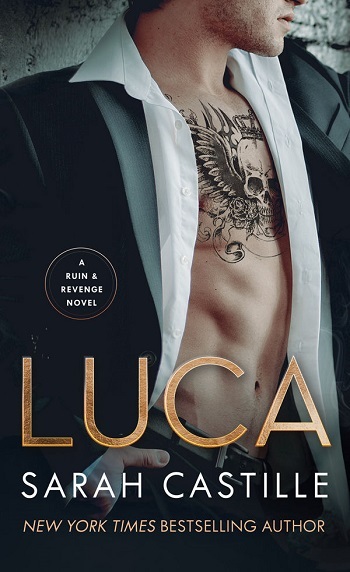 Reviewers on the Wicked Reads Review Team were provided a free copy of Luca (Ruin & Revenge #2) by Sarah Castille to read and review.